Pressure-velocity compounding is a combination of pressure compounding and velocity compounding. 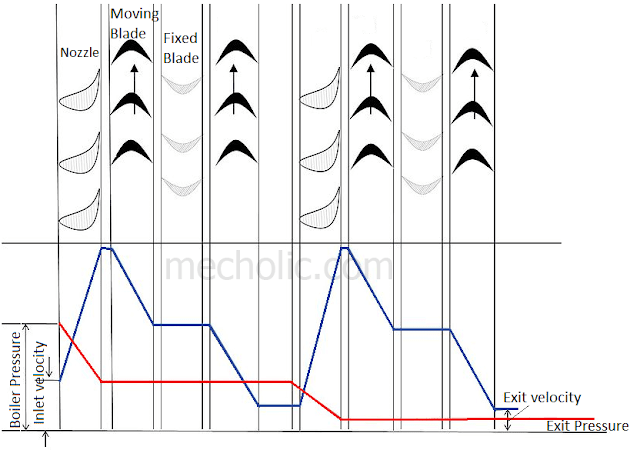 The fixed nozzle, moving blades and fixed blades are arranged as shown in figure. Both kinetic energy and pressure energy extracted from steam in multiple stages. Here, while steam passes through every fixed nozzle the pressure drops and velocity increase. The gained velocity will be absorbed by the moving blades. The fixed blades used to redirect the fluid to moving blades. The velocity of steam remains same when it passes through the fixed blades. The pressure remains same in both fixed and moving blades. The pressure-velocity curve shows that both kinetic energy as well as pressure energy will be get absorbed by the turbine in stages. This type of compounding known as pressure velocity compounding.